What are webhooks? Webhooks are user-defined HTTP callbacks from a platform to an external service, triggered when a pre-defined event occurs. In our case, webhooks are send when someone fills a form. ❗️Right now we don't send webhooks after the response, just after filling the contact form. If you want to get custom webhooks for survey answers feel free to reach us- we are open to feedback and would love to hear from you! How to set them up? You need to go to Settings > Addons and pick Custom webhooks from the list. 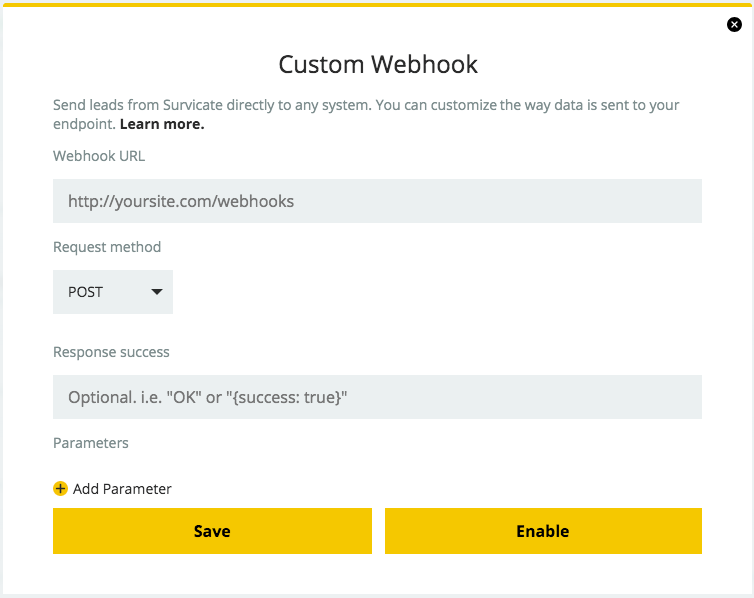 Then you can specify webhook URL, request method (either POST or GET) and optionally the success response. You can also pass additional parameters from Survicate such as form ID, contact data or custom cookie values and customise their name.